We are proud to announce this year's recipients of the NM EPSCoR Mentoring Award: Catherine Brewer, Assistant Professor at New Mexico State University; Marty Kirk, Distinguished Professor at the University of New Mexico; and Juchao Yan, Professor at Eastern New Mexico University. Mentors are able to create a professional and social relationship with students that encourage them to take the next step in their careers through listening, advising, supporting, providing feedback, increasing students’ networks, and solving problems, to name a few roles and characteristics (National Academy of Sciences, 1997). Mentors are essential to the retention of students in the Science, Technology, Engineering, and Mathematics fields and beyond. NM EPSCoR is fortunate to have great faculty, staff, and graduate student mentors. The NM EPSCoR Mentoring Award is designed to recognize NM EPSCoR participants who not only build relationships with students and support their academic, research, and career endeavors, but also work to create inclusive environments for our diverse students. Congratulations to our awardees! Catherine Brewer received a B.S. in Chemistry from Indiana University of Pennsylvania and a Ph.D. in Chemical Engineering and Biorenewable Resources & Technology from Iowa State University. 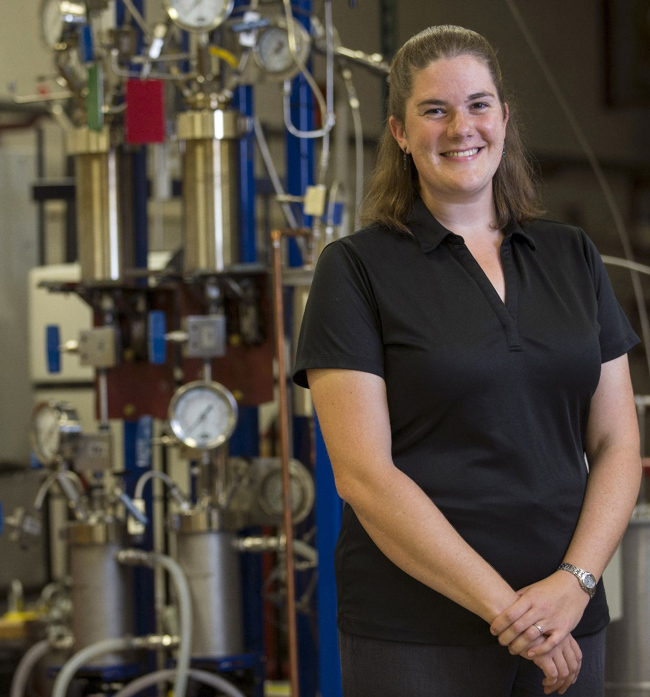 Prior to joining the Chemical & Materials Engineering faculty at New Mexico State University in 2013, she completed a postdoc at Rice University. She serves as an affiliate faculty member for NMSU’s Water Science & Management program and is one of the instructors for NMSU’s new Brewery Engineering program. Catherine was nominated by PhD student Feng Cheng. "For different types of students, Dr. Brewer would patiently treat them in different ways based on their own characteristics," Feng said in his nomination form. "For most of professors, making presentation in group meeting is a good way to ensure the progress of students, while Dr. Brewer would like to spend more time on meeting students individually so that she could know more about each student and give more appropriate advises." Catherine divides her mentoring philosophy into two parts: helping a person understand their goals, and helping that person find the path to reach those goals. "By the end of a mentoring relationship," she says, "my goal for every student is that they can confidently say what they want to do and why they want to do that. Nothing gives more pleasure to me as a mentor than to learn that students who never thought they could get this internship or that award or into a graduate program, do, and I can remind them of the doubts they had and the efforts they put in to reach that outcome." Martin Kirk received a B.S. in Chemistry from West Virginia University and a PhD in Chemistry from the University of North Carolina at Chapel Hill. Before his career at UNM began, he travelled to Stanford University as a National Science Foundation Postdoctoral Fellow. He is a national leader in the study of metallobiochemistry, molecular electronics and magnetochemistry, and was promoted to Distinguished Professor in 2016. Martin was nominated by graduate student Ju Chen. "Martin not only cares about our progress of current projects but also routinely broaden our insights beyond field of work by talk, discussion, and readings," Ju wrote in his nomination form. "He works with us just like peers, and encourages us to self-intuitively figure out solutions to difficult problems under his mentoring, helping us building up abilities of research independence." Martin stresses the importance of communication of mutual expectations and goals when it comes to mentoring. This includes discussions on skills development, career development, conduct of research, and more. "My role as a mentor is to ensure that our mutual expectations are clearly stated and understood. Regardless of the career stage of the mentee, I make sure we both understand the nature of their short- and long-term goals." Juchao Yan received a B.S. in Physical Chemistry from Jilin University and a PhD in Analytical Chemistry from the Chinese Academy of Sciences in Changchun, China. He travelled to the United States soon after receiving his PhD and was a postdoc for a New Mexico EPSCoR project at UNM before accepting a faculty position at ENMU in Portales, NM. In addition to his classes and research, Juchao also coordinates all chemistry graduate students and tries to inspire them to share his passion for science. He was nominated by David Arellano, who has worked as Juchao's research technician for three years. 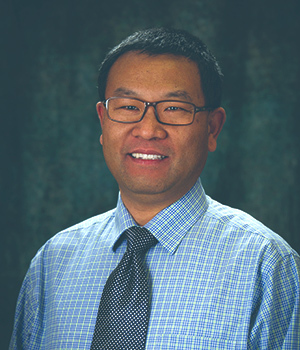 "While I have watched other students grow and learn from Dr. Yan, I realized that he was helping me to do the same," David wrote in his letter of support for Juchao's nomination. "Thanks to Dr. Yan, I am graduating this semester with a Master’s Degree in Chemistry and, beginning this fall, I will be attending a University where I intend to get my Ph.D in Chemical Engineering. This is just a small example of how I believe I have flourished under Dr. Yan’s guidance and assistance." Juchao recognizes that a mentor plays many roles in the life of a student, and understands that while mentoring in university settings can be challenging—students and faculty have busy lives, and institutional resources are often limited, especially at primarily undergraduate universities like ENMU—it is still a worthwhile endeavor. "In my opinion, an effective mentor at PUIs should, first and foremost, be creative, have good people skills, and be inspiring," says Juchao of his mentoring philosophy. "Effective mentoring relationship cannot be overstated in the success of the first-generation college students. To be effective, a mentor should be a good listener, a good communicator, and also a trusted ally, friend, and/or advocate."